(MENAFN - Gulf Times) Emergency crews searched mangled carriages Sunday for any further victims after a train crash in northern India killed 23 passengers, the fourth major accident this year on the crumbling network. Another 156 people were injured when 14 carriages came off the tracks in Muzaffarnagar district in Uttar Pradesh state, 130 kilometres (80 miles) from New Delhi, on Saturday evening. The coaches were left in a mangled heap after the express train derailed at 100 kilometres per hour, crashing into nearby houses and a college. Rescuers used gas-powered saws Sunday to prise apart the tangled metal and search the wreckage with sniffer dogs. ‘We are checking the coaches thoroughly for any survivors or bodies. We will clear the tracks today,' Anant Dev, Muzaffarnagar district police chief, told AFP. A large crowd descended on the accident site to help free passengers from the damaged carriages, many of which were upended and torn open. Some of the injured were seriously hurt but many had been released from hospital after receiving treatment, Dev added. The Utkal-Kalinga express left Puri, a temple city in India's coastal east, on Thursday evening and was scheduled to arrive in the northern Hindu holy city of Haridwar on Sunday. The government has ordered an inquiry into the accident amid speculation unscheduled maintenance work was underway at the time. ‘It's too early to make any claims. Maintainance happens round the clock but everything will be clear after the probe is completed,' a senior railway official told AFP on condition of anonymity. Another railway official, R.N. Singh, told the Press Trust of India there was ‘routine work' underway but would not elaborate given the pending investigation. Criminal investigators were also probing whether sabotage was involved. Experts blame under-investment and poor safety standards for the frequency of rail accidents. This latest derailment is the fourth major crash this year, and follows another accident in Uttar Pradesh last November that left 146 dead. In January nearly 40 people were killed when a passenger train derailed in the southern state of Andra Pradesh. 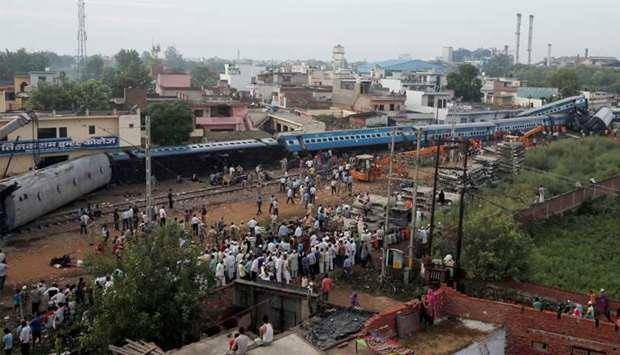 A 2012 government report described the loss of 15,000 passengers to rail accidents every year in India as a ‘massacre'. Prime Minister Narendra Modi has pledged $137 billion over five years to modernise the crumbling railways and his government has signed numerous upgrading deals with private companies. Japan has agreed to provide $12 billion in soft loans to build India's first bullet train, with Modi and Japanese Prime Minister Shinzo Abe tipped to break ground on the project in September.